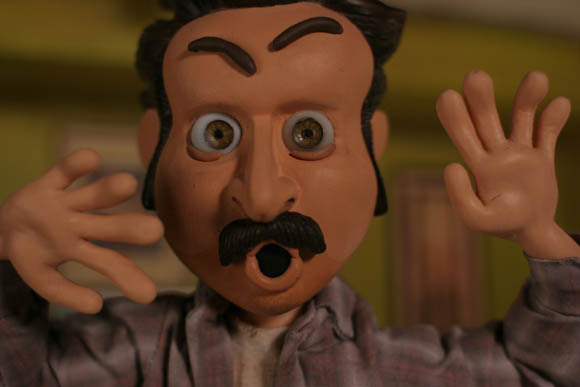 I haven’t seen the World of Warcraft South Park yet, but I did manage to catch the recent stopmotion/claymation episode of My Name is Earl before I left Australia. Matlosz handed 1920 x 1080, 24p digital still image sequences off to Buck, who took them into After Effects. Buck: I use a plug-in from The Foundry’s TinderBox collection called Deflicker. It has six or seven different ways to remove flicker from the stills. You can perform multiple passes with each different setting. One of the hardest things to do is keep the frame-by-frame lighting consistent. Matlosz: Digital cameras aren’t designed to be frame accurate with luminance, chrominance, gamma, anything. Those things don’t stay consistent frame by frame. They just don’t match. That’s the one issue you have shooting digital time-lapse or digital stop-motion. Buck: What really kills the stills is any kind of camera moves and rack focuses, so the Deflicker filter was a lifesaver. But there are times when even Deflicker falls short. Times when a light is bumped or a bulb goes out and needs to be replaced. For those kinds of problems, we adjust the levels manually to ensure frame-to-frame consistency. I’ve dealt with some of these issues before, but even with everything locked off on a manual lens there is often some flicker remaining. Deflicker seems like the obvious answer.